The future of Windows computers could soon be worn on your face. Today, at a special media event in New York City, we got our hands on the first Windows 10 “mixed reality headset” from Acer. The device is only a developer kit for now, but it’s expected to be commercially available by the holiday season this year. 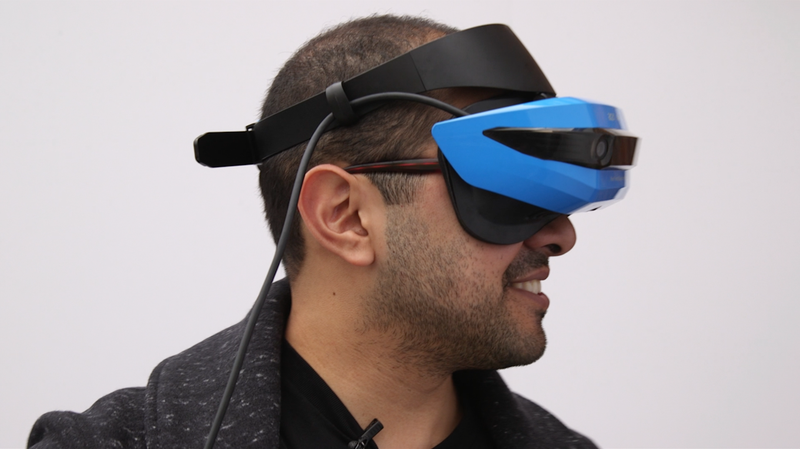 In practical terms, this is actually a virtual reality display meant to compete with the Oculus Rift and HTC Vive, however, Microsoft is calling this mixed reality for a couple of reasons. First, the Acer headset includes 3D mapping software built directly in, meaning it doesn’t require wall mounts or separate infrared cameras to track your position in a room, unlike the HTC Vive and Oculus Rift. The other reason it’s being called mixed reality is because it will soon be able to interact with HoloLens, Microsoft’s augmented reality headset. According to Acer and Microsoft, this is the lightest headset on the market (weighing just 350 grams), and after putting it on my face, it’s really easy to believe. One of my biggest complaints with the HTC Vive and Oculus Rift was that they weighed too much, and after a few hours, it left cheeks feeling sore from pressing against my face. People even coined a term “Oculus Face” because it became such an issue after a huge VR bender. It’s hard to imagine this Acer headset leaving imprints on your cheeks after a few hours of use. It was super comfortable to wear, and I surprisingly never had to adjust it—something I can’t say about the Vive or Rift. You attach the headset to your face by pressing the goggles up to your eyes, then clicking a ratcheting strap lock on the back of your head (similar to fitting a bike helmet). It’s worth noting that this particular headset tethers to a PC by a 4 meter (13-foot) USB cable. It’s easy to imagine the cable getting in the way during longer gaming sessions, but during this short demo, it wasn’t an issue. The Windows Mixed Reality experience—which is already baked into every Windows 10 computer with the Creator’s Update—launches into something called the Cliff House, which essentially just serves as your home base while you’re in virtual reality (much like a standard Windows desktop screen). The experience in the Cliff House feels like you’re standing in a multimillion-dollar beach condo with a bunch of blank walls and a basement. You can walk around the home by actually walking around in the real world normally, or you can use an Xbox controller to move to different parts of the mansion by pressing a button. It takes only a few seconds to get your bearings after first putting on the headset, and after that, you can start launching applications through a quick popup menu controlled by the Xbox controller. When you launch an application in Cliff House, it shows up in a large virtual window that can be resized to look as though its as big as a movie screen or as small as a picture frame. The windows can be resized just like they would be on a normal desktop. This is where things started to get kind of insane. Since the entire platform is based on standard Windows 10, it’s able to run any Universal Windows Platform (UWP) app. This means things like the Microsoft Edge browser, Excel, Word, Outlook, and Xbox One games can be run on one of the windows in the Cliff House. We started the tutorial by navigating to “My Documents,” an area of the operating system familiar to anyone who’s ever used a Windows machine. The folder was populated with a bunch of standard 2D and 360-degree videos. We launched a short surfing video that played in 2D on a wall inside the Cliff House. Then we launched a 360-degree video of Machu Picchu that completely engulfed my field of vision. When the video was over, I was transported back to the Cliff House. When the My Documents part of the demo was over, I walked over to a different part of the home by navigating with the Xbox controller because I was too lazy to actually move. I was then shown a demo of the Microsoft Edge browser, which was plastered on one of the larger walls inside the home. I was extremely skeptical about using this gigantic wall-sized browser to read an article inside of the headset, but followed along with the Acer tour guide, who was talking me through the process. Surprisingly, it was really easy to navigate to Nasa.gov and start scrolling through stories using the Xbox controller. Reading the article was also really easy. I used the left thumbstick on the Xbox controller to move closer to the window, just like I would in a video game. It felt very natural and the headset’s 2880 x 1440 resolution was more than enough to keep the image sharp and easy to read. Whether I’d ever actually want to do something like this is an entirely different question. It’s hard to imagine launching normal applications like Outlook or Microsoft Edge in virtual reality when they already work just fine on a standard laptop. I honestly can’t see a reason anyone would ever want to write an email or crunch numbers in Excel while in virtual reality. The one exception to this is internet video content, like Netflix, which would be awesome to watch on a 70-foot-wide screen. Who doesn’t want a private theater in their own home? After these two brief (and honestly kind of unusual demos), I took a few extra second to walk around the Cliff House. I noticed in the basement, there was a large Xbox logo in a virtual private theater. I asked the Microsoft team after the demo about how Xbox would work with the headset, and they had two answers. First, you’d be able to livestream an Xbox game into the headset so that you feel like you’re playing in your own private theater. Secondly, they said you might someday be able to use the headset as an accessory to the Xbox, but reps wouldn’t reveal any actual plans—only possibilities. This gets back to the whole point of Microsoft’s idea of mixed reality. If you ask any technology expert, they’d tell you that this is very obviously a virtual reality headset. But the key piece to Microsoft’s narrative behind this technology is interoperability. Microsoft wants all of its products to work together: desktops, laptops, Xbox, and headsets. It’s all based on Windows 10, and this is largely the idea behind Universal Windows Platform (UWP) apps. It’s correct to see this all shot at the HTC Vive and Oculus Rift, though. The headset is nearly just as powerful in terms of resolution and refresh rate, and Microsoft is essentially undercutting their businesses. It’s easy to imagine that entry prices have been a big factor in people’s decisions about whether to buy VR headsets. As Gizmodo senior reporter Christina Warren recently pointed out, under two million VR headsets have been sold across the three major platforms. Acer wouldn’t say what the price of its mixed reality headset will be, but Microsoft said third-party headsets will start at $300 (about $200 less than the Rift and Vive). Microsoft also said these type of headsets will be capable of running on integrated graphics cards by the end of the year—meaning you don’t have to shell out a bunch of cash to get your hands on one. It’s definitely exciting from a gamer’s perspective, but it’s still hard to imagine why you’d ever want to run a 70-foot version of Microsoft Excel—or any of the other apps we habitually use.